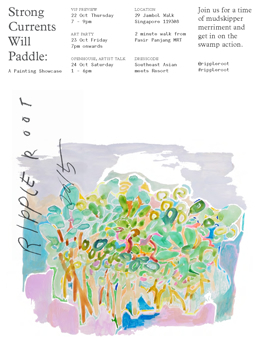 RIPPLE ROOT is the artist moniker of Liquan Liew and Estella Ng. In their work is a distinct Southeast Asian ornamentation, seen in the dense, interwoven patterns that borrow from arabesque tiles and textiles. Folkloric elements, based upon naive renderings of birds and various wildlife are given a modern twist. Set around the Mangrove Swamp at Labrador Park, a stone’s throw away from Pasir Panjang where we worked out of-literally making these paintings out of Estella’s living room. These smelly, muddy marshes that people no longer give any time or attention to are one of the most threatened habitats of the world today…We wanted to celebrate the Singaporean spirit without being too literal or clichéd. A series of paintings featuring interiors, wildlife and various garden scenes. In these you will find hints of Burgeoning and Blossoming; of growth & fancy new beginnings…all synonymous with our symbolic move into the new studio premise at Ming Arcade. Still paying homage to Jambol…how could we ever forget them classy Victorian furniture pieces? We delve into primitivism, with naive renderings and folkloric scenes that are descriptive and speak of ancient tales. This series pays homage to ancient Southeast Asian traditions of Batik and traditional textile weaving. The first instalment was held at The Fishtank, then we boarded a plane, took the show to Hundred Years Gallery in Shoreditch, East London. 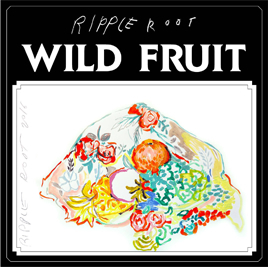 A first for Ripple Root! 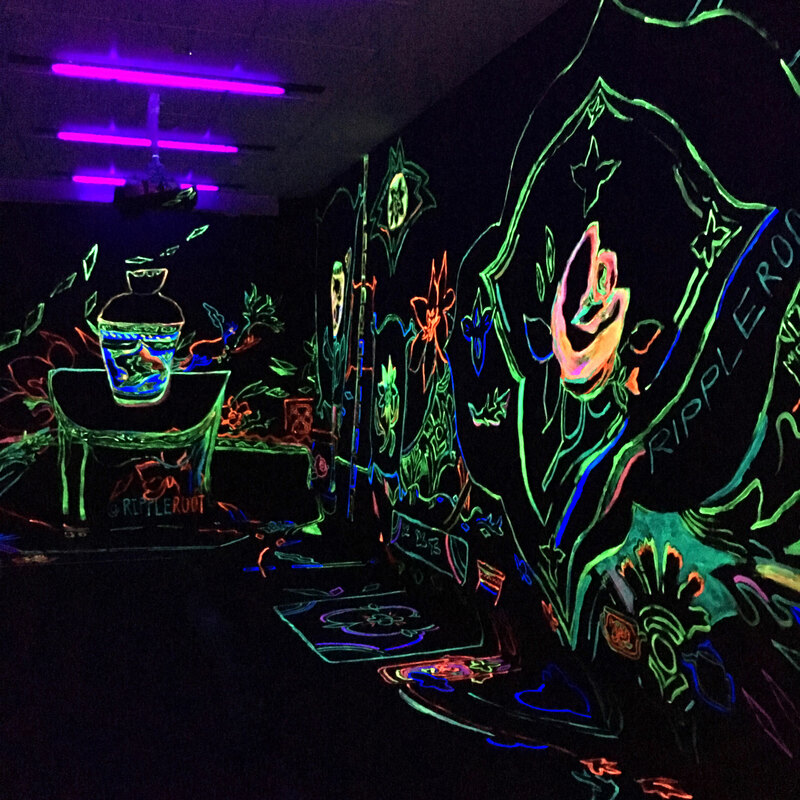 Commissioned by the Peranakan Museum for Singapore Night Festival 2017, this is RR’s inaugural attempt at the use of glow-in-the-dark paints and black light. Vessels are brought to life, whispering Baba-Nyonya secrets and revealing traditions past. A spirited cavern that lures you in, inspired by the museum’s Permanent Collection. 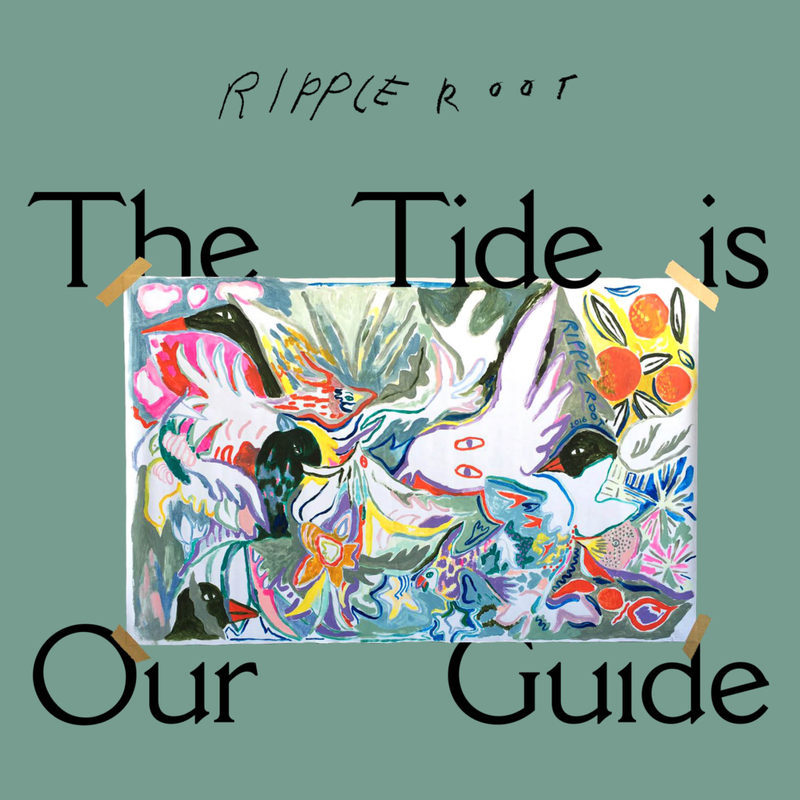 The Furthest Coast is Ripple Root’s fourth showcase. 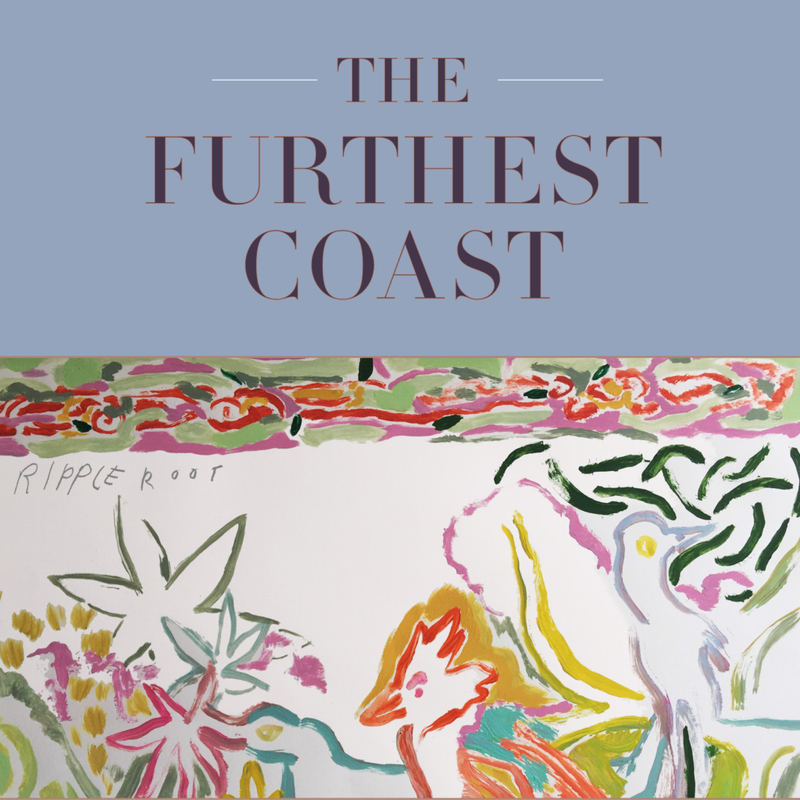 Specially curated for The American Club, the pieces speak of being out in open water- such is the nature of life, full of ghastly great unknowns. A reminder to never lose faith, but with renewed optimism make steady transitions towards new shores and greater destinations. 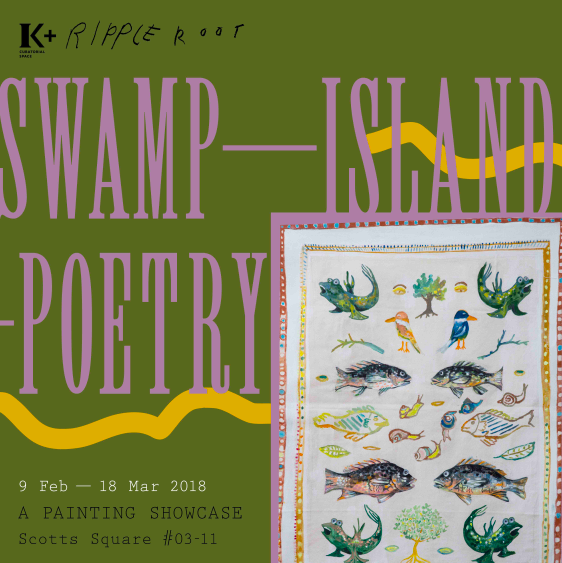 SWAMP-ISLAND-POETRY addresses the rhythms of the everyday, stemmed from the duo’s first inspiration for their art- the Mangrove Swamp, the dwelling place of mudskippers, local birds and flowers.The show will be held at K+ Gallery (Scotts Square) in Singapore and Brunswick Street Gallery in Fitzroy, Melbourne. “I think this must feel like Paradise” is a collection of paintings on longing, being free and the search for joy. 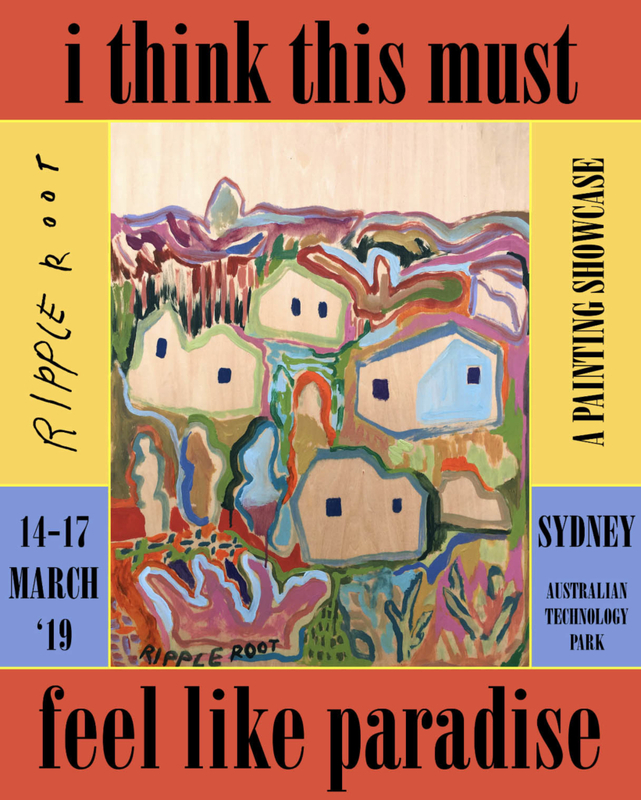 Inspired by beach houses, they are painted on wood, displaying expanses of ripe colour and landscape.